What a good idea, this day! To reflect, take stock, to enjoy peace, to deplore non-peace. And the first reflection is this: peace is the normal condition of humanity, just like health. There is so much plain, simple, decent behavior around, so much mutual aid, a helping hand, companionship, friendship, good neighborhood when bad luck strikes at its worst. And we sense mutuality, unquestioning reciprocity; not always but mostly. Go to an airport, stay close to where they come out, arrival, and are met by their nearest–watch the embraces, the warmth, the eyes glittering, the smiles, laughter. There we are. Harmony, resonance–with the occasional deep, joint sadness, sorrow; something has struck. Go to a restaurant, not too stiff, formal–more ordinary eatery. And you see it again, the pleasure, food, drinks, togetherness, the shared pleasure–the jokes, the smiles. Most of the time–then some incident, issue arises. Like health: there is so much physical and mental wellbeing if we care to notice it, including our own–then some disease, minor or major, strikes and captures all the attention, indeed of the media. Most of the time most of us live in peace and health. The world is not belligerent, any given year for everybody, just because two countries had a stupid war; nor unhealthy for everybody because of a malaria or ebola, epidemic, however bad for the victims. Let us keep a sense of proportion. Like in highway traffic, most driver-vehicle-meters driven are by far flawless. Then: an accident. We focus on accident-prone drivers, cars and road stretches like on belligerent states, cultures and structures, to learn (why not also from the best?). But that should not blind us to all the peace and health; even vertical companies, capitalism, often function–but when not, the damage may be devastating for so many for such a long time. Do we reflect on peace or non-peace? On both, of course. Peace. That little word, one or two syllables, 3 to 5-6 letters, fred-rauha-mir-peace-vrede-Friede-paix-paz-pace-pau-beke-eirene-shalom -sala’am-shanti-ho ping-heiwa, to mention a few. Short, unassuming, so compelling. Very concrete things to do–some more difficult like handling trauma and conflict, some easily done, simply exuding warmth, love; clothing warm thoughts and feelings in warm words and acts. But that little word stands for much more and disappearing into the clouds and beyond. “Do not make drawings of me”, it says, “do concretize but that never catches more than a fraction of me. I am the spirit that gives meaning beyond biological life, beyond physical health. I am that which unites you all–“. The soul of cooperation, not only the give-and-take in the famous “doing to others what you want them to do to you”, somewhat beyond not doing to others what you would rather not have them do to you. There is something flowing, something beyond “goods and services” and “pleasure, pain”. Some kind of medium, ether if you will, in which our relations are embedded, sown with seeds of peace, blossoming into full flowers at ever higher, more complex levels. Positive peace. Sense that medium grow. A We-ness takes shape. The egocentric doing and not doing to others yield to shared joys and sorrows with others, to egos embedded in a We, Us, to resonance, to true harmony. Watch that medium expand, from your nearest to a humanity thirsting for compassion; sense their ups and downs, your compassion may touch them. Build bridges in your imagination, to Ruskin-Gandhi’s Unto This Last; not only to the suffering, also to the fulfillment. Let both in. Permit yourself to be touched, to be inspired. Watch that We-ness deepen, into some kind of fusion. Self and Other become one, if only for the fraction of a moment, a oneness. The ego becomes small; the relations, also past, future, overwhelming. Concrete peace, or spiritual peace? Both, of course. Nature. Goethe’s famous “Über alle Gipfeln ist Ruh, Über alle Wipfeln spürest Du, Kaum einen Hauch” is a hymn to nature peace as quiet, windless. That is one nature peace. Another nature peace. In Spain, up there, are two clearly gendered mountains, huge–Adam and Eve. They exude peace in their eternal stillness, unmoving, yet immensely touching and inspiring. Be it windless or stormy, equally faithful. The guardians are there. Yet another. A river with waterfall and eddies, a beach with the rhythm of waves, long, rolling in, forever. All is movement, like snowflakes in the wind on a winter day; yet there is rhythm and harmony. The water freezes, the ocean flattens, the snow covers the earth. It is the Rule of Law, Nature’s laws–maybe one day negotiable with less distance to Nature–our freedom is insight in them (Hegel). Art is a medium. The music fills us, and we are in the music, those moments of oneness, in a plush concert hall or on-the-rock, in a street. That spiritual beyond us in any art; in time as music, literature; in space as paintings, sculptures; in both as drama, theater, opera. Written art may more easily communicate concreteness, but for that reason also be divisive; abstract form for eyes or ears may be less divisive, more unifying–but for what? Whatever the answer, there is that moment of oneness, of unity. Precious. The natural or the artistic? Both, of course. May peace prevail. This article originally appeared on Transcend Media Service (TMS) on 22 Sep 2014. Anticopyright: Editorials and articles originated on TMS may be freely reprinted, disseminated, translated and used as background material, provided an acknowledgement and link to the source, TMS: May Peace Prevail on Earth! 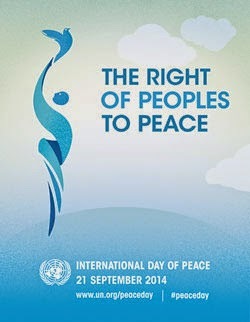 — International Peace Day 2014, is included. Thank you.